Sew what have you been up to? At a minimum, I’ll dust off that $400 sewing machine she bought me so it doesn’t look quite so neglected. But I know she’ll want to see other signs of progress. I’m thinking I can throw a few fabric scraps on the floor, wear a measuring tape around my neck, and tell her I’m working on something “really big.” I’ll also randomly measure everyone’s inseam because I specialize in awkward and overkill. Should be a great week. That’s right, WEEK. Not a weekend. Not even a long weekend. No, no. We’re talking about an extended week here, people. The in-laws are flying right by the sacred one-week mark and staying two more days beyond that. Because why the hell not? So I’ve got 9 days of lies ahead of me. NINE DAYS. I can’t really be held responsible for my actions during that amount of time. I can generally keep it together and make conversation for 4, 5, or even 6 days. But 9? What more is there to say? How many times can we talk about the garden or the weather? At some point we will HAVE to discuss my sewing. She’ll probably try to have me committed. Rightfully so. Rightfully sew. 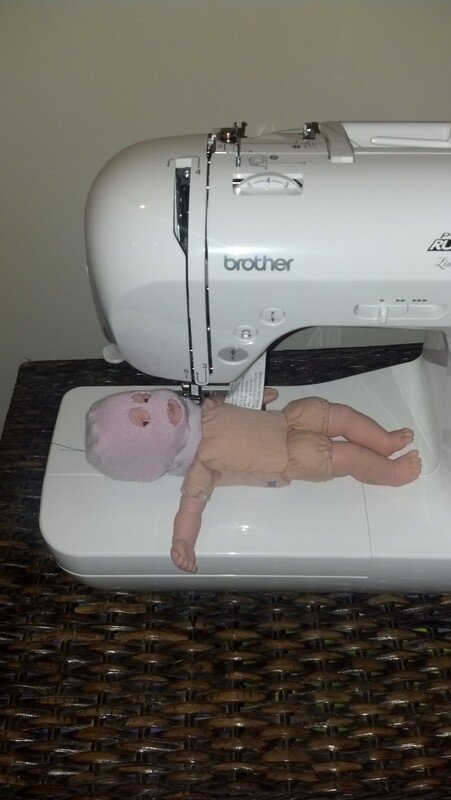 This entry was posted in Uncategorized and tagged Creepy Baby, in-laws, sewing by BananaWheels. Bookmark the permalink. OMG that ski mask, that IS AWESOME. I can’t sew. I really wish I could. I want to learn to thread a bobbin. And the long in-law visit? You have my sympathies. Escape to Facebook whenever possible and say you’re “doing work”. Good luck! This is positively hilarious! The doll in the fruit is killing me (not literally, but I do not believe that it might be possessed and using a knife possible. What?) My mother-in-law sews so well she doesn’t need a pattern. I am not crafty. My oldest daughter has an affinity for sewing. GO BOND WITH YOUR GRANDMAMA WHILE I PLAY RUZZLE. I could send you some KatyBaby stuff and you could claim it as yours. Brilliant. Or since your sister lives here, maybe she could just come sew things on my behalf in my sweatshop, I mean basement. 9 days is a lot…phew! I say break out the sewing machine on day one and get your MIL to show you how to make dresses and then just get her to make all the dresses. Teach your daughters to beg for dresses. You can’t talk over the hum of the machine so you’ll have time to come up with new topics to talk about over dinner. Creepy baby can be your dress making sweat shop manager. I am pretty sure that if you leave Creepy Baby staged JUST LIKE SHE IS IN THE PICTURE, your in-laws will be cutting the trip short and getting the hell outta there. I’m glad that photo gives someone else the willies too. Notice how Creepy Baby actually looks like she is giving me the side eye, begging me to get her out of there. Poor thing. Eww, she IS giving you the side eye! CREEPY BABY JUST GOT CREEPIER! Hilarious. Freakin’ hilarious. 9 days is a long time. There is an old saying “fish and guests start to smell after 2 days”. Not sure if that’s the way it goes. Good luck. Hey! Make some little pouches to hold fish! “I specialize in awkward and overkill.” I died from the laughter. The pressure, THE PRESSURE! Go ahead and show her creepy baby. She’ll never stay 2 days past a week again. Lol!!! This creepy baby doll picture is the best ever! Death by sewing machine? I don’t know but I get a weird kick out of inappropriate things, I might watch too much horror tv. On it. Note to self: one potential disadvantage of living overseas – very long visits from family.